Scioto County Prosecutor Shane Tieman, right, swears in new assistant county prosecutor Scott Evans. Scioto County Prosecutor Shane A. Tieman recently welcomed a new Assistant Prosecutor to his staff. Attorney Scott Evans joined the Scioto County Prosecutor’s Office and will be responsible for handling adult felony cases in Scioto County Common Pleas Court. The Lawrence County native is a graduate of Capital University Law School and Ohio University. He also holds additional degrees from Defiance College, Franklin University and the U.S. Army War College. Evans is a decorated combat veteran who retired from the military in 2010. He currently serves on the Shawnee State University Board of Trustees. He has practiced in Ironton since 2011 and was described by the prosecutor’s office as possessing extensive experience in the area of criminal defense before becoming a prosecutor. A press release from the prosecutor’s office did not specifically say so, but Evans most likely is taking Tieman’s old spot in the prosecutor’s office. Tieman himself served as an assistant prosecutor for Scioto County prior to his election as prosecutor in November. 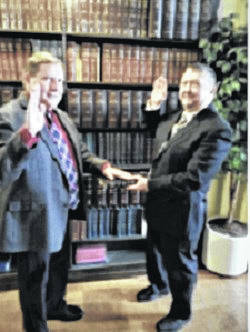 https://www.portsmouth-dailytimes.com/wp-content/uploads/sites/28/2019/02/web1_new-assistant-prosecutor-bigger.jpgScioto County Prosecutor Shane Tieman, right, swears in new assistant county prosecutor Scott Evans.